We are sold out of advance tickets for this show. There may be some limited standing room only tickets available once the show starts at 8:00 pm for $28.50. 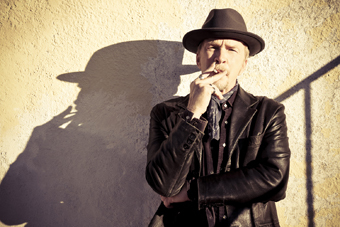 Roots rocker Dave Alvin brings us the burning, guitar-centered blues from his new CD, Eleven Eleven (Yep Roc). Returning to the style of music that defined his early career, Dave performs rockin tunes with vivid stories that extend from R&B royalty to labor history to Harlan County, Kentucky. Dave and his brother Phil burst onto the California music scene in 1979 when they formed the Blasters, earning an enthusiastic cult following across the United States and Europe with their pioneering confluence of punk, blues, California country, and rockabilly. After leaving the Blasters, Dave had a stint as lead guitarist for the punk band X and played with the alt-country band the Knitters before embarking on a solo career. Driven by the constant impulse to explore distant musical horizons, Dave earned a Grammy Award for Best Contemporary Folk Album for his 2000 collection of traditional folk and blues classics, Public Domain: Songs From the Wild Land.